I’ve been told I need to update my blog more regularly by people who think my life in LA is exciting. At this stage, it is not life that is exciting, it is the locale that is exciting. America in general is odd, making LA extra odd, therefore, exciting. Some of it I’m used to, some of it still baffles. Saw Alicia Silverstone at the Hollywood farmer’s market yesterday. Possibly also Steve Aoki. We are noticing the more places we go, the more fake and plastic people seem to appear (this is a new thought and not related to Steve or Alicia, who still look fine). Especially women in their 40’s-50’s… E is always pointing out bad nosejobs or overly-puffed botox cheeks or lip injected, leathery-skinned women. Sometimes when we’re out on a weekend stroll (a.k.a. hike in the mountains), we’ll see women out hiking or jogging but they are wearing push up bras and velour track suits and have hair extensions flying all over the place in 95 degree weather… no jogging gear or ponytails at all. Not even SWEAT. We say these are the women who are out for their weekly liposuction maintenance. It’s just incredible how looks are so important here. Even the newscasters are funny looking. Big fish lips and tiny little bodies in their late 30’s-mid 40’s wearing age-inappropriate clothing. That sort of “youth” wear that looks stupid on even me. The news here is pretty much a joke anyway, so everything works out in the end. Heather (a fellow runner from my adventure running group) and I have joined forces and are training for the Long Beach Marathon in October (if my iPod didn’t break last week, it’d be loaded with motivational Beach Boys tunes). On Tuesday, we ran a 10 miler from Santa Monica Pier to Venice Pier and back – all along the boardwalk at sunset. We ran the first 5 miles in a little over 33 minutes – a superfast tempo. The beach is where everyone wants to be these days as almost every day for the past two weeks has been in the triple digits. I think the cooler weather was a blessing for us as it went up to 108 in Van Nuys last week. On Friday, H & I met up with her coworker Dave and ran “hills” in Griffith Park. Hill training here isn’t doing repeats up one neighbourhood hill like in Toronto (running up, running down, running up the same hill again, etc. ), it’s a full-out 8 miler where the entire thing is just one long climb, often on a dirt trail where you have to watch out for lizards. Reward? You can see forever at the top. My first “hills” session a week prior was a 9 miler in Runyon Canyon. The entire thing was up. LBC Marathon, you better bring it!!! A note about fruit: it’s everywhere. Those who are used to it definitely take it for granted. For a visitor like me, I’ll post a whole blog about finding an avocado on the side of the road. E and I walk past a relatively low-growing lemon tree on our walk to the Burbank farmer’s market each Saturday. Every time we walk past, we look up and snag one or two of the dozens of ripe lemons just hangin’ there waiting to be plucked. One day, the kid from the house noticed us eyeing the lemons and he said we can have as many as we’d like (it’s not like there are only 10 of them – the tree is literally loaded and they are falling onto the ground and rolling into the street). When I told the boy that he was lucky to have so many ripe lemons right in his yard, he said, “we don’t eat em, my mom buys powdered lemonade” :O ! 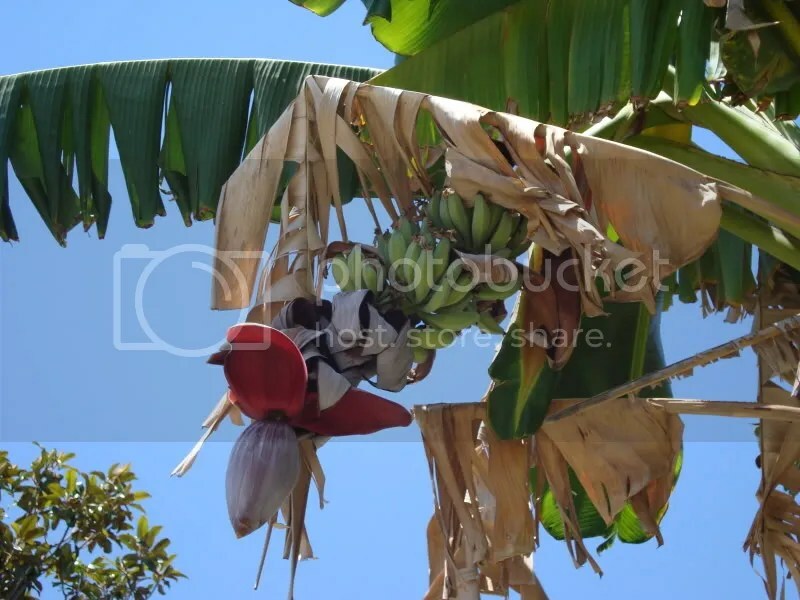 Also, how crazy ugly is the banana flower? On par with actual bananas is Healthcare. E is thinking of getting a checkup and I have been at the computer all morning trying to figure out Anthem Blue Cross… for the closest family doctor! I had to fill in all this online stuff for E and then he has to reply to an email. H is a PHD student in clinical psychology and once she finishes her degree she’s seriously considering working in Canada. She was involved in a car accident a few years ago and the first thing she screamed when she regained consciousness was “I don’t have insurance!”. This is not the way it should be. I really hope Obama figures out something that works well for everyone. You guys! We’re going to Hawai’i in 2 weeks for A&P’s wedding! My vacation-within-a-vacation is soon! Life = loca!